Customizing Fonts and Emojis in Google Docs – TC Net-Works, Inc.
By default every document that you create in Google Docs will have 11 point Arial font unless you change it. You can change that to one of more than 450 font options. 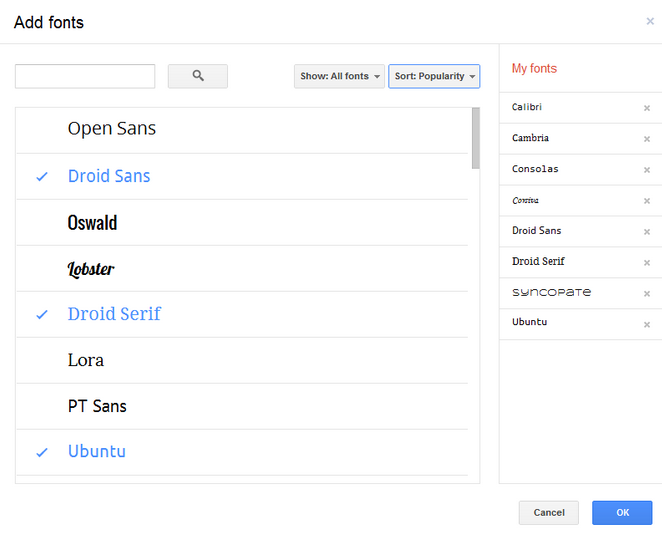 To access and add custom fonts to your Google Documents and Slides select “add fonts” from the bottom of the font selection menu that you’ve always used in Google Drive. Selecting “add fonts” will open up a new menu in which you can mix and match fonts to your heart’s content. The screenshots below provide visual directions. Just because you’ve changed the font for one document that doesn’t mean it will automatically apply to the next document that you create. That can be done by changing the default font. This video shows you how to change the default font in Google Docs. And just for fun, Google Docs makes it easy to insert emojis into your documents. Here’s a video on how to do that.